Becki Brannen is a thirty-something writer born and raised in the heart of Georgia. Her debut novel, Breathless, is the result of NaNoWriMo 2011, having been written in just twenty-nine days. 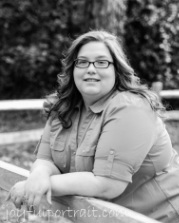 Becki primarily writes “chick lit with a Christian twist,” marrying one of her favorite genres with her Christian faith. Her life verses are Jeremiah 29:11 and Isaiah 41:10. Becki and her husband have twin daughters and a poodle, Sophie. God is my number one inspiration, and honoring Him. I love bringing a real take to the Christian chick lit novel, giving characters the depth, decisions, and dilemmas that we Christians face in our everyday lives. I’m a plotter and then a pantser! If I get stuck on a scene, the characters start doing crazy things, spoiling all my well-laid plans! We talk in the car. Usually with the window up, but if not, I just look a little insane. I just think that the only way to have meaningful dialogue is to actually speak it out loud. Don’t give up, and don’t give in. Your work is YOUR voice. Don’t change it for trends, publishers, or anyone else. I started off indie, but I had the opportunity to come aboard Vox Dei Publishing, the “Christian books for a messy world” imprint of Booktrope Publishing. The managing director is my favorite author ever, and has been a wonderful mentor and inspiration to me. That said, go check out Heather Huffman! I think it’s changing. No longer do you have to be a part of the mainstream publishers to be successful. That said, only through careful editing should books be sent out into the world. The self-pub market is so saturated, often with books that aren’t quite up to snuff.